On February 13th of this year, I came home from work and played the new messages on our answering machine. My mom’s voice came across the line crying and hysterical, informing me that my grandpa had died that afternoon. My grandpa, Richard Norton, grew up farming cherries and apples in the Yakima Valley of eastern Washington State. He witnessed the transition from draft horses to tractors and the arrival of DDT as the “farmers miracle.” After leaving the farm at 18 to serve in the army, he returned, not to the farm, but instead to college to become a music teacher. Supporting himself by playing in jazz and big bands, he received his degree, married my grandma, and began his thirty-year teaching career. By the time I came along in 1983, Grandpa was retired and back to farming. He split his time between his home in western Washington and the old family farm on the eastside, caring for the fruit trees and running the harvest crew at picking time. As a kid I only knew my grandpa as a farmer, his flannel shirts smelling of diesel, his 4:30 a.m. wake-up, his hours spent driving the tractor up and down the orchard rows. I loved to ride the tractor with him and play in the old irrigation ditches between the trees. When I first started farming, my grandparents were baffled. Why would anyone choose that life, when they had worked so hard to escape it? But to me, Grandpa was a farmer, not a music teacher. I couldn’t understand why they weren’t supportive of my choice to farm. 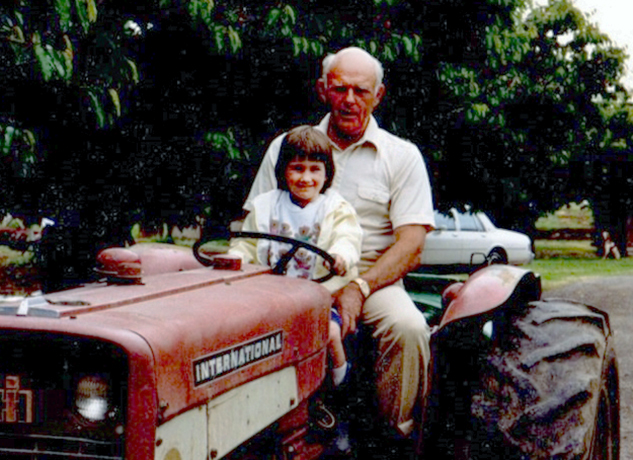 But as my farming years continued, and it was apparent I was not going to quit, Grandpa became more and more interested in my farm adventures. Each time we saw each other, he would ask me how the crops were doing and what I was planting next. The death of my Grandpa leaves not only a huge hole in my family but also truly marks the end of an era. An era of family farming and big band music, a time before smart phones, social media, and the internet. Losing him has only further cemented for me that farming is my calling and strengthened my desire to begin our “new” family farm. It will look different from how he did things, but the history is there, helping me along. My own path to farming began at the end of college. Graduation loomed, and I had no idea what was next for me. I had studied Latin American studies and Spanish, and thought that I wanted to get involved in migrant farmer rights as a labor organizer or pesticide awareness as a public health worker. I had no plans to become a farmer myself, I just wanted to help farmers get paid more and limit their pesticide exposure. At the time, I was living in my first communal housing situation, complete with chickens, a compost pile, and shared meals. 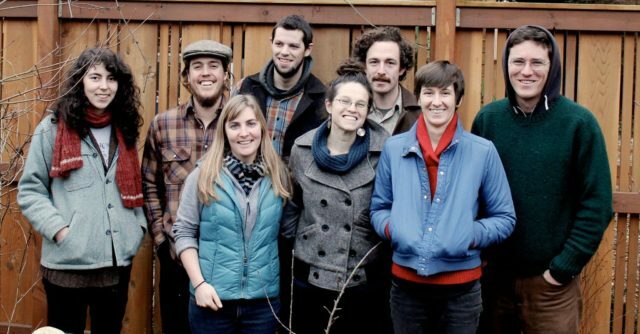 One of my housemate’s had a friend managing a farm on the small island of Vashon near Seattle, and he was looking for an intern for the upcoming season. I was graduating in December, so the timing was right. I took a ferry out to the island and toured the two-acre Hogsback Farm, along with the one room—a tiny cabin/pottery studio—that would be my home for the season. I would be paid $250 a month and all the vegetables I could eat! I made up my mind right away, and was fortunate to be offered the job. 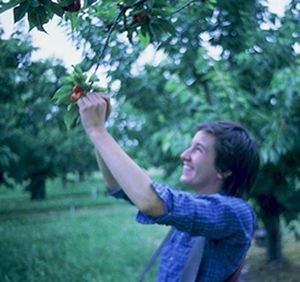 One season turned into two years at Hogsback, which led to another apprenticeship in coastal California, a year back on Vashon Island, then urban farming in Portland, and two seasons farming in Port Townsend, Washington, which ultimately led to spending 2014 in southwestern Ontario, Canada, working at Orchard Hill Farm (orchardhillfarm.ca). Nine years into my farming career and I was back to being an apprentice, something I had not planned or even thought I would be willing to do ever again. I had done my share of apprenticeships, and felt well above and beyond that phase of farming. But Orchard Hill was different: a seven-acre, draft horse-powered vegetable farm that also grows grain for the horses and other animals. My partner Brandon had convinced me that we needed to try farming with draft horses for a season before deciding whether it was right for us or not. I truly did not want to return to the days of the $400 monthly stipend, but living in Canada for a season and farming alongside Martha and Ken Laing felt worth it. The Laings have been farming their 93 acres for over 30 years and have used draft horses for most of that time. If I was going to learn, it would be from two master teamsters. Looking back on the experience now, I recognize how it much it has changed me as a farmer and shaped the whole future of my farming career from here on out. 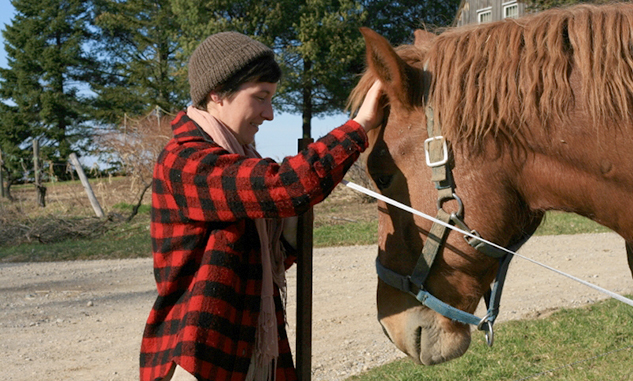 Three weeks into my apprenticeship at Orchard Hill, and I was hooked on the horses. Now I can’t imagine farming without them. We hope to have our own team by this fall, and as I am writing this we are getting ready to visit a prospective team in Idaho this weekend. Having started farming right out of college, I did not have another career from which I made lots of money before farming. Brandon and I both have student loan debt, which at this point I don’t foresee us ever paying off. Starting Furrow Horse this year has been an experiment in piecing together the capital we need to get our business up and running. The keys to starting our farm were finding an affordable land lease situation and receiving a Kiva Zip Loan. We also both work part-time jobs off the farm to pay our rent and land lease. It is an exhausting existence, especially in these summer months of long, long days and abundant harvests. But each time I wake up and look out over our field, our farm, I am reminded that I am in the right place. I know my grandpa would have thought so, too. « previous article: What services would help your farm business?